Good To Begin Well, Better To End Well: Sif, Goddess of... Prosperity? Thor's wife, Sif, is only related to us in any real detail in two places. 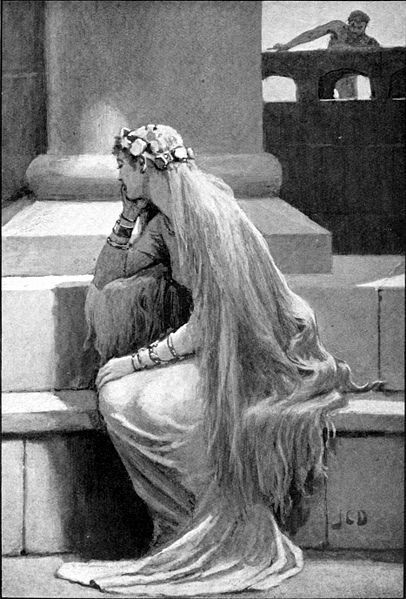 A story in the Skáldskaparmál (from Snorri's Prose Edda) during which Loki shaves off her hair in the night as a cruel prank, and within a poem called the Lokasenna in the Poetic Edda where Loki insults by turns the majority of those residing in Asgard, Sif included. Sif is greatly upset by the loss of her hair, and Loki, to make amends (and probably to prevent Thor from delivering a beating he wouldn't soon forget) retrieves for her a wig of golden hair from the dwarves to replace it. In the Lokasenna, Loki accuses Sif of taking him as her lover. We don't know if Sif actually did have an affair with Loki or not, as it is neither confirmed nor denied anywhere else in the remaining myths and she doesn't refute it in the poem. We know Sif is beautiful, but other than these two accounts, we know nothing about her character. My own interpretation of Sif from these bits and pieces is of a vain goddess, and from the way she addresses Loki in the Lokasenna it almost sounds as though because of her relationship with him, she expects him not to insult her. I wouldn't be surprised if Loki appealed to her vanity to get her into bed with him, since Thor is so often out wandering and getting into fights with giants. But there's a third discussion of Sif's character that I mentioned in a later post, from the Lay of Hárbarðr, wherein a disguised Odin, in a match of insult with Thor, tells his son that Sif is having an affair and he should get back home and deck that guy instead of standing around unarmed in a battle of wits. Add to this the established fact that Sif has a son, Ullr, who is most explicitly named as Thor's step-son, and it gives you some food for thought. Either Sif had an affair with someone before her marriage to Thor (totally plausible) or she had an affair after she married Thor. Admittedly, both of these accusations regarding Sif's fidelity are brought out in Flyting Poems, wherin the entire point is to out-insult the other party. And just as admittedly, calling a dude a cuckold is probably low-hanging fruit. But you have to wonder. Or at least I do. Especially when there is so little else to support any indication of Sif's character beyond the story of her hair being shorn, are these two references to her as an adulteress preserved for a reason? Is it another way to show that Thor is kind of a dumb ox, too stupid to realize his wife is fooling around behind his back? But if so, it's only powerful if it's true. Now it's pretty well assumed that Sif's golden hair is an association with wheat and the bounty of the harvest, and her marriage to Thor is maybe representative of the union of sky god and earth goddess -- the rain falling to fertilize the fields -- but I'm not sure this makes Sif herself a goddess of fertility, so much as it reflects upon Thor's position as a god of fertility. But what if Sif with her golden hair made of magic, practically living gold, was a goddess of prosperity instead? The sheering of her hair being representative of the harvest and the reaping of wheat is pretty well accepted, but instead of Sif growing that hair back like any normal person, it's replaced with gold. What if she's the goddess invoked to protect the STORES, the goddess of the gathered bounty, and the wealth it can provide in exchange. There isn't, that I've found so far, any sign or symbolism related to Sif as a healer, but prosperity is hardly limited to grain and money (though I do kind of like the idea of her being a goddess of bread and beer, just because... alliteration). Prosperity is a product of health -- a man being strong enough to plow his fields and plant his seed, then capable of harvesting it, bringing it to market after that. It's a product of surviving childbirth and raising those kids to adulthood to help work the fields and support the family. But if she's a goddess concerned with wealth, that certainly might relate to greed and vanity, in addition. Success and prosperity is so often caught up in honor and respect. Appearances and keeping up with the Joneses, next door. And if Thor is running around having affairs with Giantesses -- Jarnsaxa is the father of Magni, Thor's son -- and leaving her at home while he goes about Adventuring, it isn't difficult to believe that Sif might be inclined to punish him for the perceived slight to herself. And what Sif can give by way of prosperity, bounty, children, gold, honor, health, I have no trouble believing she can take away. Maybe that's why the only child Sif and Thor have together is one, single daughter, Thrud.